This slide from the PowerPoint presentation prepared by General Growth Properties (GGP) shows the general concept for a mall in SoNo. NORWALK, Conn. – If General Growth Properties (GGP) is allowed to build a mall in South Norwalk, that mall, in its third year, would deliver more than $2.8 million in tax revenue to Norwalk, according to a third-party projection – and that projection does not include the hotel proposed for the property, GGP Senior Director of Development and Municipal Analysis Doug Adams said. The paperwork shuffling has begun for the mall project, with the Dec. 8 submission to the Redevelopment Agency and the city of the proposed amendment to the Land Disposition Agreement (LDA) for the property, which comprises Reed Putnam Urban Renewal Area parcels 1, 2, and 4. The requested amendments include said hotel and the approval to put a mini-electric generation plant on the property. 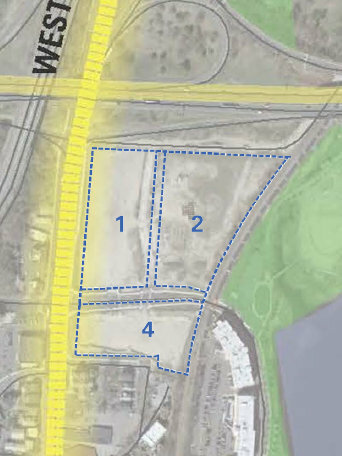 This slide from the PowerPoint presentation prepared by General Growth Properties (GGP) shows the configuration of Parcels 1,2, and 4 in the Reed Putnam Urban Renewal area. It also includes 2,500 to 7,500 square feet of education space, which Adams said GGP will build whether or not Norwalk Community College (NCC) is on board as a partner. The mall itself would be 975,000 square feet, with 700,000 of that devoted to retail, and the balance for back-of-the-house use, loading and common areas, Adams said. The hotel would be 80,000 to 175,000 square feet, according to the amendment request, which specifies 100 to 200 rooms, although Adams is talking 150 rooms. The LDA amendment must be agreed to by both the Redevelopment Agency and the Common Council, with the Council’s Planning Committee doing the nitty-gritty work before the full Council gets to vote. Redevelopment Agency Executive Director Tim Sheehan said the current work being done is by RDA Chairman Felix Serrano and Planning Committee Chairman Doug Hempstead (R-At Large), who are trying to work out a schedule for both bodies to consider the proposal simultaneously, thereby expediting approval. GGP is waiving a big carrot with its deep-pocketed proposal to build the mall ASAP. Because the mall is in an existing Enterprise Zone, its real estate taxes are abated for the first two years. In its third year that abatement would be cut in half, and GGP would pay 50 percent of its tax assessment. It would pay 10 percent more every year after that, so it would pay 60 percent of its assessment in year four, 70 percent in year five, and so on, until it’s paying its entire obligation in year eight. Not like the tax boost won’t be significant when the mall is an infant. In its first year, it would pay $740,000 in personal property tax, for which there is no abatement, according to the projection done by HR&A Advisors. That’s for things like cash registers and light fixtures, Adams said. For the vacant land, the tax would be $158,172, according to the projection. In the third year, the personal property tax would be $770,000, in addition to the first property tax bill – $2.1 million. By year eight, the total tax revenue would be $5.48 million, according to the projection. 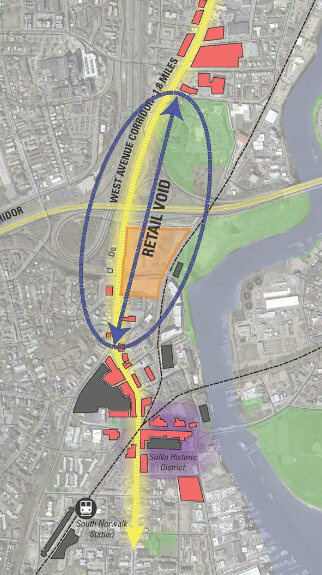 The Enterprise Zone is doing what it should be doing, Adams said, asserting that it has encouraged development in SoNo. And, “If the site had to actually turn into something else and that took another two years, well, you’ve used the two years of the abatement anyway,” he said. That projected tax revenue boost does not include a hotel. Adams expressed confidence that the hotel would be built. “We have gone out and talked to the people in the industry and have been pleased with the people’s feedback on the location and what we are planning, because they have to like what we are planning,” Adams said. That optimism is supported by a study commissioned by the RDA, he said, although the study did not include the possibility of an extended stay hotel being built by FD Rich Co. on South Main Street, next to the Norwalk Police headquarters. That proposal was recently approved by the Zoning Commission, but Adams said it doesn’t matter. GGP could potentially build the hotel itself, he said. A lease to an operator would be for “decades, not years,” he said. The lobby for the hotel, essentially just a place to check in, is designed to be on the ground floor, accessible directly from Pine Street and the parking garage entrance there. The hotel’s 3,000 to 4,000 square feet of meeting spaces as well as its gym and other amenities would be on the same floors as the mall. The rooms would tower over the mall in a structure that is a maximum of 12 stories, or 175 feet tall. Some guests would get a view of Long Island Sound and others would see the Norwalk River. You might not think there’s much in the other directions, but Adams said he had looked from the roof of an 8-story condominium complex in the area and had come to a different conclusion. “The views toward the hospital are nicer than I thought. Because you are looking up West Avenue toward Waypointe – it’s an urban view – you’re looking over Oyster Shell Park and Matthews Park,” Adams said. Another carrot for Norwalk: space for the Norwalk Museum and NCC to exhibit parts of their collections, Adams said. The beach and the oyster industry would also be spotlighted in the mall as part of the branding of Norwalk, he said. There also would be cultural performance spaces. GGP tries to have at least 18 performances a year in its malls, Adams said. “We’re not going to just show movies,” he said. This slide from the PowerPoint presentation prepared by General Growth Properties (GGP) shows the “retail void” on West Avenue. There might be a small skating rink, because GGP has done that in some of its other malls, he said. The education space might be in the back of the mall, along the railroad tracks, or adjacent to the parking garage, he said. He’s talking 5,000 square feet. He mentioned NCC’s architectural programs, 3-D modeling classes and catering school. “We can offer the location, the transportation, the parking and the facility,” Adams said. The current LDA calls for the redeveloper to spend $600,000 on connectivity. “We remain committed to that investment,” Adams said. “The feedback we received from the community and leaders is that GGP should focus on working with the Transit District to create a sustainable circulator for South Norwalk and all of West Avenue; as well as bicycle and pedestrian connectivity to surrounding assets including Oyster Shell Park, Maritime Aquarium, SoNo Historic Restaurant District, and Matthews Park and its museums. The proposed electric generation plant would provide power for the mall only, according to the LDA amendment request. It might be continuously interconnected with the outside power grid; transportation terminals would be designed as an integral part of the structure. Adams said GGP strives for sustainability. The company will study potentially using solar, wind or geothermal energy, he said. The lighting would be LED and the company has a habit of composting its garbage, he said. Rain water would be collected and used on the landscaping, as would the compost, he said. GGP would like to use the now-abandoned Crescent Street for delivery trucks and emergency vehicles, he said. Although GGP thinks the road would be a private street because of right of way issues, the company would like it to be open to the public, he said. But that’s up to the Department of Public Works, he said. The proposed LDA amendment, attached below, refers to Phase I and Phase II of construction. $5 million plus for the city? That’s great news. All NPS parents should be behind this 100%. As a Norwalk taxpayer who is tired of 3-5% property tax increase, I am excited to see the private sector growing the tax base. Let the propaganda begin. Don’t be fooled here – 2.8 million really? Will this cover the free school lunches and welfare subsidies that taxpayers will need to cover for hundreds of nonliving wage jobs that the mall will create for the influx of new citizenry in Norwalk? Will this cover the wear and tear on road infrastructure? Past is prologue and Norwalk should learn from its failed retail experience. Taxpayers have suffered enough and shouldn’t be on the hook to spruce up corporate profits at the expense of subsidizing non living wage jobs. Will Crescent St continue as a street from West Ave, or does the part of it from West Ave to the turnpike bridge become part of the land dedicated for other development ? Map is not clear. The clever GGP headline tells us: Now it’s the catchy “SONO” Mall, and we are told it will stuff Norwalk’s coffers. We can only wonder what the assessment predicted to bring in all that tax money into Norwalk’s coffers will be when “SONO” Mall is ten years old and the baseball cap outlets have moved in. In the interim, it appears that except for the additions of a tacked on hotel and a 5,000-foot store room for community college the proposal is virtually unchanged from what it was many months ago when it received a landslide of criticism. Even the “Jewell Box” protrusions are still with us. We can predict that the “SONO” Mall will just bring in more stuff to a town that already is overstuffed with Big Box retail. should market conditions require. If that is the case, in my opinion this is just going to be another “mall”. We also wonder if the proposed “SONO” Mall goes in, as it appears is inevitable, what will happen to the real Sono, which has effectively been an open street mall–especially with so many specialty stores now vacant there. Great idea as the original Sono concept was, it did not bring in a tide of Long Island boaters for shopping and dining, nor has it brought in shoppers from surrounding towns right here in Fairfield County. What about getting the state to give back to Norwalk some of the tens of millions of dollars the state will gain from the project? Have any of our many political leaders with strong connections to Hartford and the governor explored this? Why should the state gain when Norwalk is taking the risk? Any idea when the Council is expected to vote? All the more reason Norwalk really needs a qualified, sound, thoughtful planning professional to head up the P&Z. Said planner would be able to address this very real concern. Does any one know the approximate proposed construction cost? For years many of us have questioned our state legislators on why they have failed to enact a Sales Tax give-back to the communities like Norwalk who harbor the big box stores. It would seem fair for us to get .5 to 1% of the 6.35% state sales tax rebated back to Norwalk to cover the costs of infrastructure and police/fire services that are required to support large retail developments. I would like to bring to the attention of concerned citizens a front page article in the New York Times, January 4, 2015: “The Economics (and nostalgia) of Dead Malls”. The article speaks about the dying Owings Mills Mall, once thriving but now joining a growing number of shuttered or largely vacant malls. “Having opened in 1986 with a renovation in 1998, Owings Mills is young for a dying mall”. And finally, “The original owner of Owings Mills, General Growth Partners sold a 50% stake to Mr. Simmons company (Kimco) in 2011”. The artist’s renderings are absolutely gorgeous. Slick and hip, and a true vision of the “New Norwalk” that we all want. A young woman carrying an attache’ crossing West Avenue (to get to the Shell station?) Pedestrian traffic on the sidewalks (going where?) but, alas, they’re only sketches, and they could show us a picture of Dorothy and Toto directing traffic, but will any of this become reality? A good read for those concerned.